This page attempts to record what is known about the origin and history of the traditional origami design known as the Orizuru or Paper Crane. Please contact me if you know any of this information is incorrect or if you have any other important information that should be added. Thank you. According to a report in the Asahi Shimbun on March 14th 2017, the oldest known representation of the Orizuru has been found on a kosuka, a decorative panel intended to be attached to the hilt or sheath of a sword, which can be reliably dated to between 1537 and 1603. 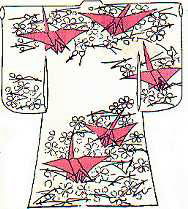 Origami in the Classics, by Satoshi Takagi, published by the the Yasuhiro Sano, publishing office, Nippon Origami Association, in 1993 includes an illustration from a design book for dyed goods published around 1700 which features Paper Cranes. Paper Cranes are also among the designs illustrated in a woodcut from a Japanese book by Hayato Ohoka published in 1734 called 'Ranma Zushiki' which contains prints of decorations intended to enhance sliding room dividers. The Senbazuru Orikata, a book of origami designs, woodcuts and poetry was published in Japan in 1797. Senbazuru means 1000 cranes. Orikata is an old word that means the same as origami. The number 1000 in the title is used symbolically, since in Japan, cranes are associated with good fortune and long life. Despite the title, if you folded all the designs in the book you would only have folded about 250 cranes in all. The designs are created by cutting slits in large squares to divide them into several, or many, small, but not completely separate, ones and then folding each smaller square into a paper crane. The folded cranes remain connected by beak, legs, or wingtip when the design is complete. More information about the Senbazuru Orikata can be found here. The story of Sadako has been told in the West in a number of books and films, not all of which are very true to the facts. The earliest book to mention her, although only briefly, was 'Strahlen Aus Der Asche' written by the Austrian journalist Robert Jungk who had visited Hiroshima in 1956 and heard Sadako's story from a family friend called Kawamoto. He gives the number of paper cranes that Sadako folded as only 644 (p161 of the English translation entitled Children of the Ashes). Another Austrian, Karl Bruckner, published the children's book 'Sadako Will Leben' in 1961. This book was translated into English as The Day of the Bomb. It is a fictionalised and romanticised account of Sadako's life and death and gives the number of cranes she folded as 990. Another children's book, also giving a fictionalised and romanticised account, 'Sadako and the Thousand Paper Cranes' was published in 1977 by the Canadian born author Eleanor Coerr. 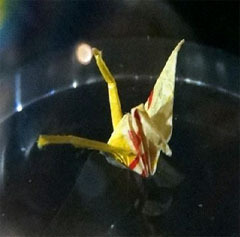 Following Jungk, the number of cranes Sadako folded before her death is given as 644. Folding and stringing together a thousand paper cranes has become a common way to express a general desire for peace, or a more specific hope that nuclear weapons should never again be used, and many such strings are sent every year to the Hiroshima Peace Park to be displayed on or near Sadako's monument. Strings of a thousand paper cranes are also sometimes made as a more personal expression of good wishes for those who are unwell or dying. It is not altogether clear whether these various practices are a continuation of a pre-existing Japanese tradition or something completely new that has arisen as a result of the popularisation of Sadako's story.